We know you want a good, reliable service to provide you with the help you need when you do your assignments. Picking out a site with good reviews, one that will give you the best work for the cheapest price, one that definitely isn’t a scam, sometimes isn’t easy. So, today we ask: is assignmentclock.com legit? Read along with us as we investigate the site and let you know our findings. Assignment Clock provide services to high school and college students and seem to cover just about any work you might want done, from essays to case studies to editing and formatting to speeches and PowerPoint presentations. They have many free perks like an introduction page, free revisions, free references and formatting, and free order delivery. We checked assignmentclock’s Refund Policy and noted that they only provide refunds under very specific circumstances, and even then, only refund up to 90% of what you paid. Quality’s important to you, and it’s important to us too. We want to be sure you’re getting the best for your money. Assignment Clock has plenty of praiseworthy testimonials but did not provide any samples for us to check over. We noted that the text on the site is somewhat clumsy in how it words things at times and doesn’t sound much like a native English speaker wrote it. We also checked Google for any external reviews, but were unable to find anything, suggesting that assignmentclock.com is relatively unknown and has not actually served very many customers. 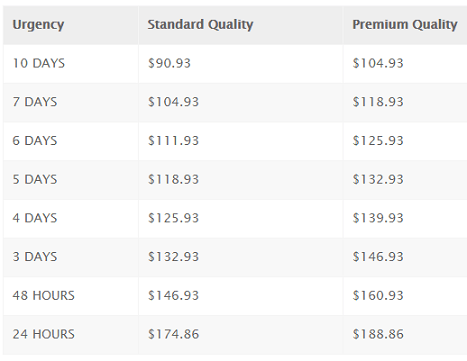 We ran a quick quote for a 7-page essay using double spacing and were able to quickly see that a 4-day deadline would cost us $139.93 AUD for a Premium Writer, whereas a 10-day deadline would be $104.93 AUD for a Premium Writer. Essentially, the quicker you need your paper done, the more it’s going to cost you, and the price gets very steep indeed if you want it done in 24 hours, all the way up to $188.86 AUD. The front page of the site also had in clear evidence a discount code for 15% off on your first order, and there were hints that other coupons might be made available for repeat customers. Assignment Clock does not have a Live Chat service, unlike most other essay-writing services, but does provide support email service, along with links to social media accounts such as Facebook, Twitter, and Google+. There is no indication of where in Australia they are registered. Ultimately, we feel that assignmentclock.com isn’t the best you can find out there, and there are definitely better alternatives to keep an eye out for. It’s definitely worth checking the policies of any site you’re considering using to make sure they have a robust and helpful refund policy.